It’s not every startup that gets a Twitter endorsement from MC Hammer. 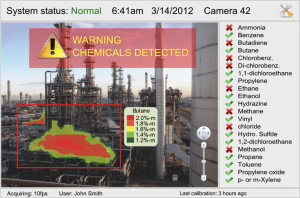 But that’s the sort of year it’s been for Houston-based Rebellion Photonics, which makes a real-time hyperspectral camera that can detect poisonous or potentially explosive gas leaks from oil refineries or rigs. While the startup has been selling its camera since its founding in 2010, its profile was recently elevated when it won The Wall Street Journal’s “Startup of the Year” competition. Mentors included Hammer, the former rap star, along with entrepreneurs such as Virgin Atlantic CEO Richard Branson and designer Tory Burch. The founders are hoping to use that momentum to close on a $10 million Series A equity round this month. Sawyer, who has a master’s degree in nanoscale physics, was completing her MBA at Rice University when she met co-founder and chief technical officer Robert Kester, a physicist who specializes in optics. The two paired up to commercialize the technology, winning a few competitions—including second place at Rice’s prestigious Business Plan Competition—and getting grant money, all of which provided both needed capital and a vote of confidence that helped to bring in $100,000 in angel investment. Initially, the founders did not immediately see the potential for their product in the oil and gas market and instead looked to uses in the life sciences. Its first camera, named the Arrow, was sold primarily to research laboratories. Rebellion also had an $800,000 contract with the U.S. Air Force. But as Sawyer and Kester began to research the camera’s applications during their work at Rice, and also at the Houston Technology Center, they began to see its use across a range of industries. The fact that its camera has no moving parts is especially attractive for the energy industry since much of its equipment is installed outside—think of the beating from wind and rain a camera could get perched on a rig out in the Gulf of Mexico. The potential market for such imaging to detect refinery leaks is about $3.3 billion, Rebellion says. Its Glass Cloud Imaging camera can spot gas leaks within 15 microseconds with a technology that uses real-time chemical detection video. The startup also says its camera takes and processes images faster than its nearest competitor, Bertin Technologies, a French company that has partnered with California-based General Monitors. Rebellion, which has seven employees, manufactures the cameras in Houston. It installs the devices for customers and charges the companies a monthly monitoring fee per camera. Energy companies didn’t immediately catch on to what Rebellion was offering, Sawyer says. For Sawyer, Rebellion’s success has also had a side benefit: Giving her a bigger platform to champion girls getting involved in science and technology.